Last week I had a weekend away in Cambridge where I was planning on doing a little blog post dedicated to the area. However it rained the whole weekend and I felt it didn't really show the city in the best light. So I've decided to go back when the weather is a little bit better and I can take photos without my fingers turning blue. Which brings me onto this weeks post, as I've decided to write about trying to be fashionable whilst staying warm(ish). As much as I would like to wander around London in a pair of blue gingham heels (see my last post if you don’t know what I’m talking about), the reality is I rarely wear heels in real life. Sometimes I think blogging can make people feel that they should be wearing heels all of the time, but honestly it’s just not practical. I’d much rather be comfortable than freezing cold because I’m wearing a tiny tea dress with over the knee boots. I'm not enjoying this icy cold weather, I always forget how cold it gets in February and I'm sure I am not the only one. I’m so pleased I’m no longer living in Birmingham in a very cold student house. So I thought I’d do a style post which reflects my style on a more everyday basis, everyone I know could tell you that I love a good pair of trainers. I've even been known to wear them to clubs, how else am I going to be able to dance like Beyonce? 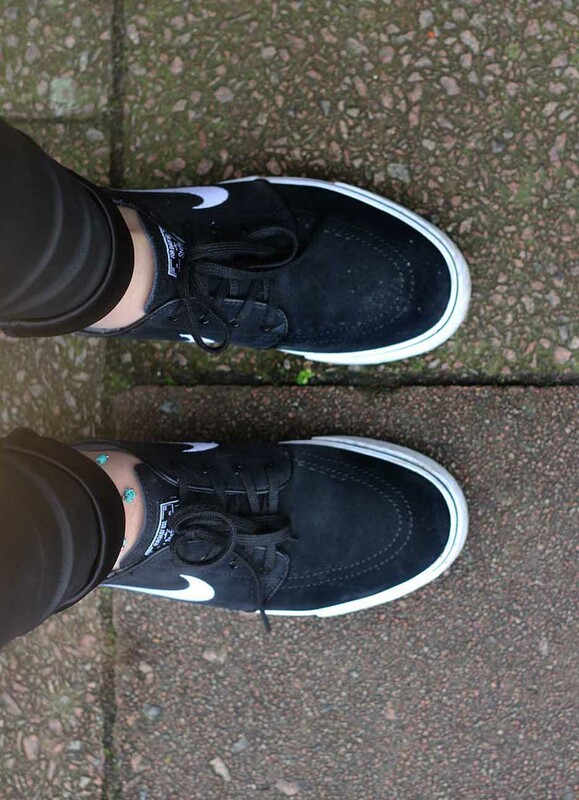 My one true love in trainer form is the black Nike Janoski’s, designed by skateboarder Stefan Janoski, this is my second pair and I can easily see myself wearing these forever. Although saying that I do have my eye on a pair of black Adidas Gazelle's, which I think could work just as well with this outfit. Please let me know if you have any trainer recommendations and I'd love to know if you're a trainer fanatic like I am. 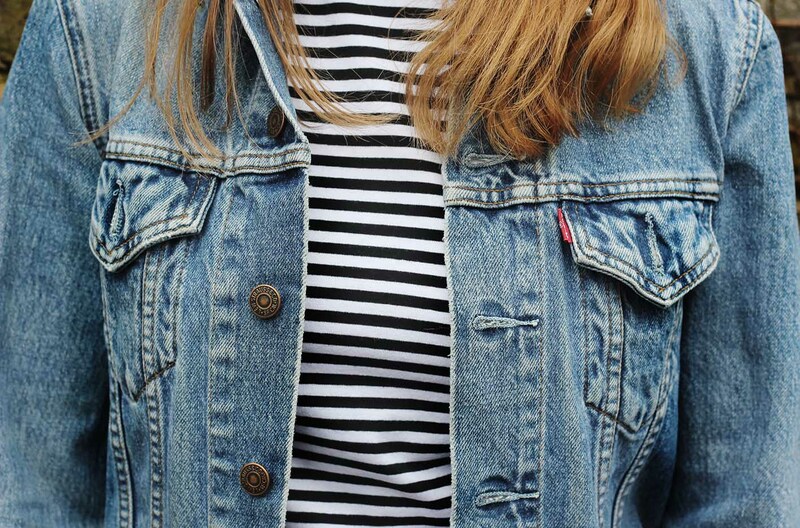 love this outfit - stripes, denim and nikes are the perfect combination! They're such a great staple to have in your wardrobe. Such a nice outfit ! You look super adorable ! I love your nikes! and I too am becoming a trainer addict. I posted an outfit on my blog featuring my newest addition of nike's http://www.katekoutures.blogspot.com/2015/02/just-do-it-nike.html..... would love if you checked it out. That's happened so many times to me too - I've been planning to blog a trip or event and then it just hasn't happened thanks to rain! Heels seem to complete any outfit, but then again casual ones like this work so much better with comfy flats. Thanks for leaving your link on twitter, really like your blog! Thankyou for such a long & lovely comment. It always surprises me when people actually read the whole post! Thankyou, I'm glad you think so too! Love this look, I've just bought a pair of trainers so I love the way you've styled these, fashion inspo for sure :) P.S rain is the biggest pain in the arse for a blogger, I feel your pain! That jump shot at the end is so adorable! Love your outfit too, I have so much trouble styling trainers or anything remotely 'practical'. I so get being 'rained off', did the same to me when I went to go and visit my sister in Durham - England behave!! Thankyou! I think with trainers you just have to go with it, I'm all about the practical haha. I love this outfit! You look so effortlessly cool!